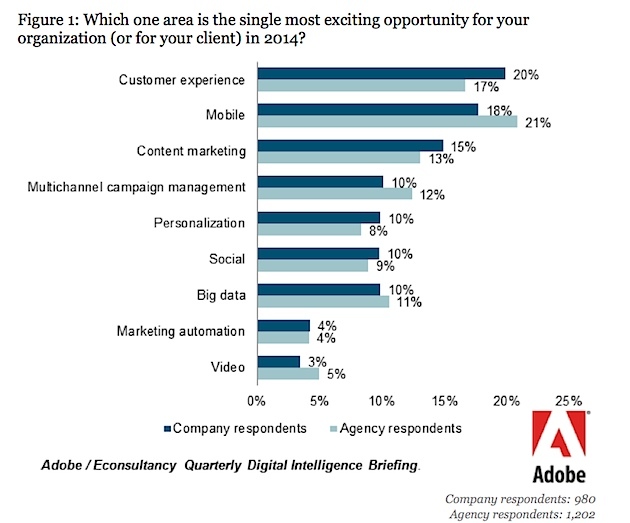 Adobe and Econsultancy released a report last week following a survey of more than 2,500 marketers. The survey covered “client-side” marketers from both the B2B and B2C worlds as well as from marketing agencies. 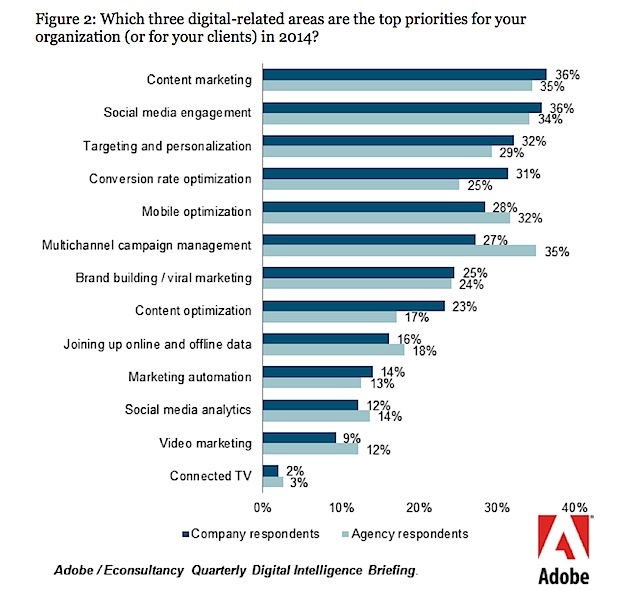 According to the report, Content Marketing is the top priority for 36% of marketers in 2014. This is followed by social media, which was chosen by 36%, personalization (32%) and conversion optimization (31%) as key areas of focus for marketing in 2014. Customer Experience is the most exciting opportunity for 20% of client-side marketers. This was followed by Mobile (18%), and Content Marketing (15%). Multi-channel management, Personalization, Social Media and Big Data all tied for the 4th spot with 10% of all marketers looking to these approaches as exciting opportunities in marketing. Agency folks see Mobile marketing (21%), followed by customer experience (20%) and Content Marketing (13%) as the most exciting opportunities in marketing. 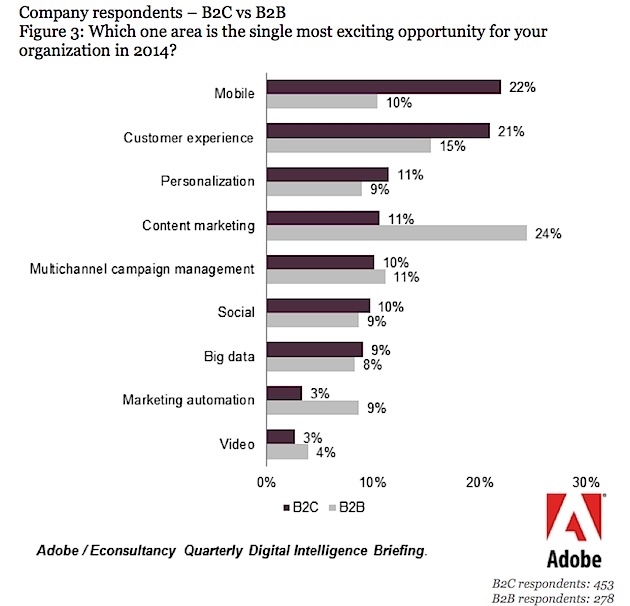 Content Marketing is seen as the most exciting opportunity of 2014 for B2B Marketers. 24% of B2B Marketers picked this as their top opportunity compares with only 11% of B2C marketers. For B2B Marketing professionals, this was followed by Customer Experience (15%) Multi-channel optinmization (11%), Mobile (10%), Personalizaiton (9%), Social (9%) and Marketing Automation (9%). I have covered most of these topics in a relatively consistent order with these results. Clearly Content Marketing is an Imperative in 2014. If your company hasn’t already identified this as a key opportunity and priority for your marketing organization, you are missing the boat. Additionally, marketing has to understand the shifts in how our customers are getting information to inform their purchase decisions. Personalization is the secret ingredient in improving your customer’s experience with your brand. And this is going to be key to breaking through the noise of all the marketing messages and information choices available to today’s consumer. And the impact of Big Data on Content Marketing is one of the biggest sub-themes to the discussion on content marketing best practices. Finally, Video was one of the lowest ranked marketing priorities in the survey. But with as much as 80% of internet traffic in the next few years coming from video, I continue to believe that visual content will be a key differentiator in the brands implementing successful content marketing strategies. Executive involvement, especially in larger enterprises where scale is still a constraint rather than a strategic advantage, is essential to shift thinking about content from a tactical expense, to a long-life strategic asset. I agree. It should be a strategic imperative just for the simple notion that companies waste so much on creating content that is completely wasted. And your second point supports the importance. We should expand the scope to hit the biggest areas of waste. Wherever the company creates content that no one uses should be slashed. Of course this mean you have to identify, track and measure content. This is one of the many the use case for companies like yours! I’m always amused by these as there is a herd instinct imperative implied “Oh, everyone else is doing this, you must too”. But actually the opposite is the case. What is needed is a graph showing which has risen most since the last survey. Then they could see what they should get into, rather than simply following last years trend. I just take it for what it is. the real trick is to decide if it’s right for your business. On the client side, we fight for budgets and everything is relative to something else much more so than last year. Last year never happened. I think the true test will be whether content marketing becomes the new spam, as an acquaintance of mine recently said, or whether marketing can provide real value with content and build something more lasting. Couldn’t agree more about the importance of video! If content marketing becomes the new SPAM then it is not content marketing. Content marketing is about creating content people want. So by (my) definition, it can’t be SPAM. But for some, content marketing is just another excuse to create more crap no one wants. So yeah I know what you mean. It’s nice to see the majority of marketers finally picking up on the connection between content and SMM. Social media networks are hugely powerful channels for driving relevant traffic, but meaningful engagement requires brands and businesses to share meaningful content. You literally cannot engage in SMM without a content marketing strategy! Great summary of the Adobe survey, thanks for sharing! Social is just the tool, the channbel, the technology. The connection point is really with the content. Social is just the tool, the channel, the technology. The connection point is really with the content. Totally agree with your comment on video. What other non-traditional content distribution channels gaining ground? Slideshare was hot at one point but seemed to have fizzled. Thanks Christine. I think visual content is the future. But I think Slideshare has plenty of life left in it. Content Marketing is no doubt the most essential element of SEO and Branding in 2014. The more content you create ( quality content ) , more are the chances to reach out to larger audience , increasing your visibility as a brand and as a blog. And as you mentioned , streaming it through right channels and directions will give the much needed boost.